Preventing Stains and Discoloration to your Property - Pro Wash LLC. 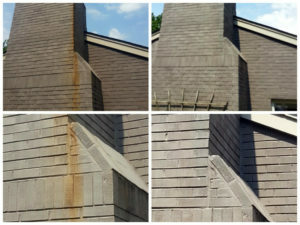 Most people in the Nashville area know exactly what to do when they find dirt, mold or mildew present on their home or businesses exterior. They call the experts at PRO WASH and the property is restored to its intended beauty, leaving neighbors jealous and passersby blinded by the gleam from the ultra clean siding. How about after the cleaning is finished? Is there anything you can do to keep the property cleaner for a longer period of time? We are asked on a daily basis about the frequency a home or commercial property should be cleaned. As always, our answer is “It is much easier and cost effective to maintain a property as it is to clean it after years of dirt and debris have set in”. 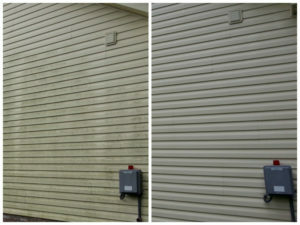 However, if you can reduce odds of your property becoming unsightly, the frequency of cleaning can be greatly reduced. Here is a list of things you can do to keep your property from developing stains and discoloration. Keep trees trimmed – Sap and other contaminants fall from trees and cover roofs, siding and concrete. Keeping tree limbs trimmed away from the structure will reduce the amount of debris that comes in contact with it, while also allowing sunshine in, which prevents mold and algae growth. Proper drainage – Wet environments promote the growth of organic matter. If water sits on a concrete or wood surface after it rains, chances are there is mold growing there. Ensuring that water drains off of a surface will keep it looking new. Spider Control – Spiders wreak havoc on a building’s exterior surfaces. A spider’s web can last years, and can withstand hurricane force winds. Most pest control companies offer a spider treatment for the exterior of homes and businesses; this can keep the spiders’ hard to remove web out of the equation all-together. Keep irrigation in the grass – If your property is equipped with an irrigation system, make sure that the water spray is not hitting the walls, sidewalks, decks or other parts of the structure. The repetitive wetting of a sprinkler will cause unsightly staining, and if irrigation water is reclaimed or pumped from a reservoir, it may already contain mold spores or iron deposits, which can cause serious discoloration. Unfortunately, every preventative measure in the world will not keep your home or business from getting dirty, but following these helpful tips should make a noticeable difference in your properties appearance. If at any time you would like free advice about any exterior cleaning issue, PRO WASH, LLC is just a phone call away.